2007-P Idaho State Quarter U.S. Mint "Brilliant Uncirculated"
2007 P Montana State Quarter New U.S. Mint "Brilliant Uncirculated"
georgeovich has no other items for sale. 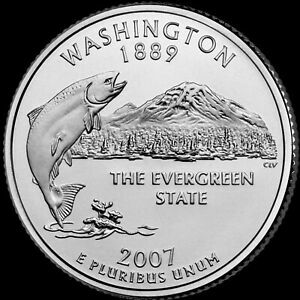 Details about 2007 P Washington State Quarter New U.S. Mint "Brilliant Uncirculated"
2007 P Washington State Quarter New U.S. Mint "Brilliant Uncirculated"
Free shipping on orders over $50.00 when you buy georgeovich's other eligible items. $0.00 shipping for each additional eligible item you buy from georgeovich. As described, well packaged. Very pleased with my purchase!